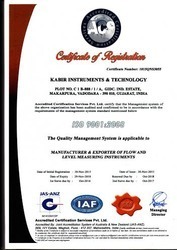 One of the leading manufacturers and exporters of this highly commendable and wide range of Flow & Level Measuring Instruments, Kabir Instruments & Technology, began its operations in the year 2012. The offered range comprises the finest Level Measuring Instruments, Flow Measuring Instruments and Flow Meter, having a high preference in the market. Making of this range is done in as per the set industry norms and guidelines, utilizing the finest raw materials and modern machines. This ensures the product’s performance and service life. further, the range is quite reasonably priced. For the purpose of attaining a better position in the market, the highly developed state-of-the-art infrastructural facility at Kabir Instruments & Technology, undergoes regular up-gradation. To help us in attaining a number of the firm’s predefined goals and objectives, the facility has been laced with all the necessary machinery and equipment. To manage the firm’s operations in a highly efficient and effective manner, the facility has been parted into several highly operational units. In addition to this, the abidance of industry set ethics, have helped us generate a huge client base. Under the leadership of our highly skilled and experienced Partner, Mr. Rikesh Bhagat, we have managed to attain a number of the firm’s predefined goals and objectives. His ability to understand the market and manage has been nothing less than a boon to us. Manufacturing, Trading and Exporter of Flow and Level Measuring Instruments. We are among the foremost manufacturers and exporters of a comprehensive array of Flow, Level and Pressure & Temperature Instruments. Our efficient professionals hold vast experience and possess broad knowledge in their respective domains to maintain our credibility in the market. Work closely to carry out the entire business process in a planned manner, their rich industry experience and knowledge facilitates us to meet specific requirement of clients. They carry out each process in an efficient manner and go through different training sessions and industrial workshops frequently to keep themselves shoulder to shoulder with current market scenario.